Mr Mark Spencer MP (Vice-Chamberlain of the Household) was received in audience by The Queen today and presented an Address from the House of Commons to which Her Majesty was graciously pleased to make reply. Lady Mary Fagan was received by The Queen when Her Majesty invested her with the Insignia of a Lady Companion of the Most Noble Order of the Garter. The headline made me chuckle - "the Queen is seen for the first time since Harry and Meghan tied the knot" - makes it seem like it's been awhile, not a day. Mr. Keith Sanderson was received by The Queen when Her Majesty invested him with the Insignia of a Member of the Royal Victorian Order. The following were received in audience by The Queen and kissed hands upon their appointment as Her Majesty's Ambassadors: Mr. Michael Nevin (the Republic of Iceland) and Miss Thorda Abbott-Watt (Turkmenistan). Mrs. Nevin and Mr. Reef Hogg were also received by Her Majesty. The following were received in audience by The Queen upon their appointment as British High Commissioners: Ms. Melanie Hopkins (the Republic of Fiji) and Mr. Stuart Gill (the Republic of Malta). Mr. Alessandro Truppia and Mrs. Gill were also received by Her Majesty. Miss Elizabeth Stephen was received by The Queen today and delivered up the Insignia of the Order of the Garter worn by her father, the late Sir Ninian Stephen. Sir Nicholas Kay was received in audience by The Queen and kissed hands upon his appointment as Her Majesty's Ambassador to the Islamic Republic of Afghanistan. Lady Kay was also received by Her Majesty. Mrs. Samantha Cohen was received by The Queen upon relinquishing her appointment as Assistant Private Secretary to Her Majesty. There were present: the Rt. Hon. Andrea Leadsom MP (Lord President), the Rt. Hon. James Brokenshire MP (Secretary of State for Housing, Communities and Local Government), the Rt. Hon. Sajid Javid MP (Secretary of State for the Home Department) and the Rt. Hon. David Mundell MP (Secretary of State for Scotland). The Rt. Hon. Sir Peter Coulson, the Rt. Hon. Robert Goodwill MP and the Rt. Hon. Kevan Jones MP were sworn in as members of Her Majesty's Most Honourable Privy Council. The Rt. Hon. Sir George Leggatt made affirmation as a member of Her Majesty's Most Honourable Privy Council. Mrs. Ceri King was in attendance as Deputy Clerk of the Council. Queen Elizabeth received the new High Commissioner for the Commonwealth of Australia today, May 30. I actually 'read' the DM article and I have to be honest, they really are sleazy. Harry and Megan's photo replaced the one of Anne and Tim. It didn't, she just rearranged her family photos as she constantly does. Anne and Tim's photo got moved more to the left and you can see the top of the frame and the tip of Tim's uniform cap above one of the chairs. Anyone who has taken note of the rooms in which HM is photographed will know that the surfaces are liberally sprinkled with family photos and that she also tends to shuffle them around and I love that she isn't into matchy-matchy picture frames. However, the DM obviously has a staffer who job is to declare who is in favour and who is not according to the photos. It fits in with their ethos of for every winner there has to be a loser and HM signals this in such ways. Next time I'll stick to the pictures which in all honesty are consistently the best. The Hon. 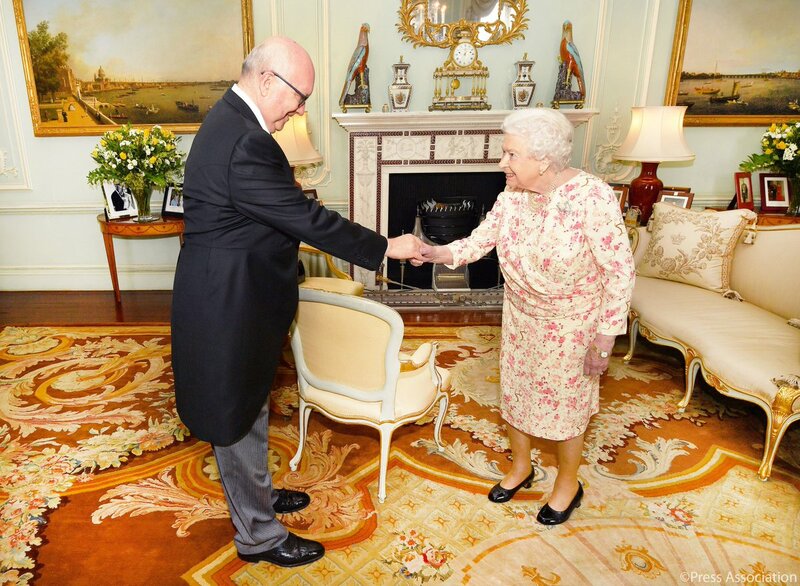 George Brandis was received in audience by The Queen today upon his appointment as High Commissioner for the Commonwealth of Australia in London. Her Majesty, Colonel-in-Chief, Governor General's Foot Guards, this afternoon received Honorary Colonel Bryan Brulotte, Lieutenant Colonel Christopher Lynam (Commanding Officer) and Chief Warrant Officer Neal Porter. Mr. Christopher Weatherley was received by The Queen when Her Majesty invested him with the Insignia of a Lieutenant of the Royal Victorian Order. Air Chief Marshal Sir Stuart Peach was received by The Queen today upon relinquishing his appointment as Chief of the Defence Staff. The Queen gave an Afternoon Party in the garden of Buckingham Palace. The Duke of Cambridge, Princess Eugenie of York, The Duke and Duchess of Gloucester, The Duke of Kent and Princess Alexandra, the Hon Lady Ogilvy were present. Her Majesty’s Body Guard of the Honourable Corps of Gentlemen-at-Arms and The Queen’s Body Guard of the Yeomen of the Guard were on duty. The Bands of the Household Cavalry and The Royal Logistic Corps played selections of music during the afternoon. It's time for a new thread, which can be found here The Queen Elizabeth and Duke of Edinburgh Current Events Part 27: June 1, 2018 - The Royal Forums .